The issue is whether to supply weapons to Ukraine. Then, on Saturday, March 14th, Russian Television, Russia’s equivalent of Britain’s BBC and America’s PBS, headlined “Poroshenko: 11 EU states struck deal with Ukraine to deliver weapons, including lethal,” and added further details, besides (presumably from Russian-Government intelligence) the specific number (11) of the nations that would be supplying weapons to Ukraine. There are 28 member-nations in the EU. Apparently, 17 of them do not want to sell weapons to the Ukrainian Government. That’s 17 EU nations which are apparently siding with Russia in opposing the extermination of the residents in the region of the former Ukraine, Donbass, where the residents had voted 90% for the Ukrainian President, Viktor Yanukovych, whom the Obama Administration overthrew in a violent coup in February 2014 under the cover of the “Maidan” anti-corruption demonstrations. 11 EU nations want to exterminate those residents and are supplying weapons that will assist in the effort. 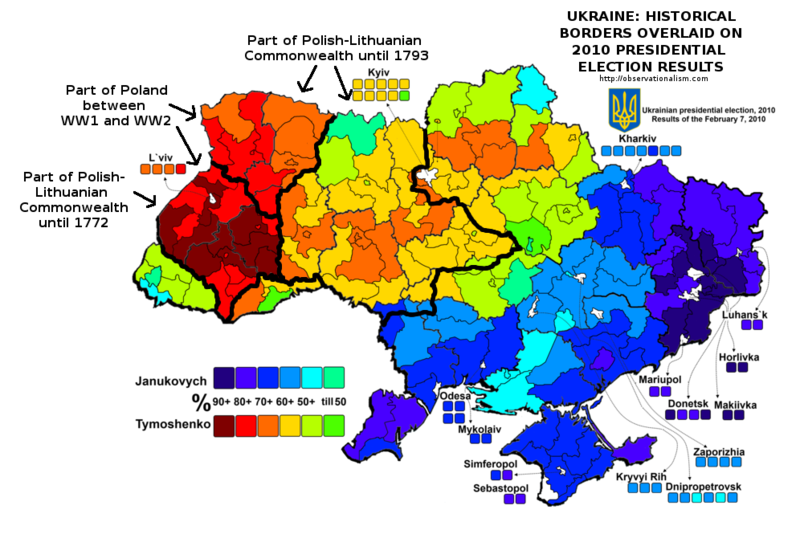 However, Ukraine’s President Poroshenko (who was elected not by all of Ukraine but only by voters outside Donbass and especially in Ukraine’s northwest, but who still claims to represent and to be the legal President of the residents in Donbass, whom he’s bombing) refuses to identify which ones they are. Thus, a minority of the EU nations are assisting the U.S. to exterminate the residents in Donbass. Meanwhile, during the past few days, German Economic News has specifically identified the following EU nations that are strongly opposed to this supplying of weapons to Ukraine: Spain, Germany, Greece, Cyprus, Hungary, Italy, France, and Slovakia. Furthermore, Italy is increasing its cooperation with Russia. And, early in January, the Czech Republic made clear its separation from the U.S. on this matter. But that’s only 9 of the 17 EU nations that openly oppose the U.S. Probably most of the remaining 8 are silent on account of their recognition how fateful their actual abandonment of the U.S. could turn out to be, and so they want to leave all options open, for as long as they can – and since they still can. Moreover, Germany lost 40 billion Euros, over $40 billion, in 2014 because of Obama’s sanctions against Russia, and other EU nations have also been enormously harmed by them. Angela Merkel wants to end sanctions and knows that this cannot happen until the U.S. stops its proxy-war against Russia in Ukraine. However, the U.S. aristocracy has benefited from these sanctions. For example, U.S. arms manufacturers are booming now, and so are the former U.S. (and still strongly Republican-Party-backing) mercenary firm Blackwater, now called Academi. “Ukraine will increase the share of military expenditure in GDP from 1.25 to 5.2 percent and spend $ 3.8 billion, the Ukrainian Finance Minister Natalia Jaresko [who is an American financier whom the Obama regime placed into that Ukrainian-Government post] says. The defense orders were received mostly by US companies like Network Technologies Corporation. So: “The Americans have stopped the EU efforts to lift the sanctions against Russia.” This has intensified the split between the U.S. and EU. However, though European governments are very harmed by what the U.S. Government is doing, some of Europe’s aristocrats are benefiting from it, and they have considerable influence within their own governments. “German economic news: Who benefits from the war in the Ukraine? Valentina Lisitsa: People on all levels. For example the arms companies, it will benefit the EU States, which are monopolized by a nontransparent hysteria, pushing to modernize their existing weapons arsenals. But even small government officials in Ukraine earn money; they take kickbacks from Ukrainians who buy their freedom from military service. There are many mercenaries [the euphemism for them is ‘volunteers’] on both sides, and the private companies that are behind these guys make enormous profits. You have mercenaries from various nations on both sides. But it is interesting to observe that no one is attacking the coal mines and factories of the oligarch Rinat Akhmetov [Ukraine’s richest person] in the Eastern Ukraine. Akhmetov sees with both sides to arrange that he will suffer no economic disadvantage. He supports both sides. German economic news: A former Commander of the battalion of Azov was appointed the Chief of police of Kiev. How is it possible that a radical rightist receives such an important position? Valentina Lisitsa: There are two aspects. First of all, the Azov battalion is indeed a radical right-wing organization. In the course of the civil war, Azov members have participated in numerous atrocities. It is not an exaggeration to say that Azov members are as brutal as ISIS members. These are not average Ukrainians. They are indoctrinated and are at the service of the oligarchs. The second issue is more complicated. In Ukraine, there are the so-called Academy of Personnel Management (MAUP) Dnipropetrovsk. This is a private college, emerged from the very many bureaucrats of the Ukrainian State [as it devolved from communism]. However, the facility is known for anti-Semitism, xenophobia, homophobia and right-national ideas. David Duke is a graduate of the MAUP Academy, and did also an apprenticeship there. Duke is a former member of the U.S. House of Representatives, and was an active high-ranking member of the Ku Klux Klan. He is a world-renowned anti-Semite. MAUP also receives donations from Saudi Arabia. So: Obama chose the nazis to run Ukraine because they’re committed to destroying Russia, and because they’re also amenable to being controlled by the aristocracy. Decent Europeans are appalled, and they’re the majority of Europeans; but because of the extreme media-censorship in the United States, where virtually all ’news’ media that have a significant-sized audience are owned (or minority-controlled) by members of the American aristocracy, which benefits from weakening Europe and destroying Russia, there are only few Americans who even know about what is happening (except the U.S. propaganda, which demonizes Putin, and which is controlled by the U.S. Government on behalf of America’s aristocrats). The closer that things get to an irreversible harm to Russia that would spark a nuclear attack against the United States – and possibly also against Europe – the bigger the split within the EU will become, and some nations might also leave NATO and ally directly with Russia, or else go neutral, in order to avoid America’s nazi (i.e., racist-fascist, anti-Russian) leadership. After all: Europe suffered greatly from Hitler’s Nazis. No major nation supports Ukraine’s nazis to the extent that America does. Would the U.S. then militarily target such a former ally? Might the U.S. attack Italy, for example? Might the U.S. attack France? Might the U.S. attack Germany? If U.S. forces are still in those countries, which will almost certainly be the case, such attacks would be extremely unlikely, and they wouldn’t be nuclear ones. Only Russia would get the nuclear bombs, if and when there will be a WW III. The U.S. and Russia would be destroyed, and everyone else would envy them, for their being already dead.